PLANTING: It can be started from seed in the winter for transplanting outside in the spring. Also can be grown from stem cuttings. HEIGHT: Grows to 3 to 4 feet. BLOOM/FRUIT: Yellow button-like flowers in late summer. Long lasting on the plant and after drying. Tansy flowers are popular in arrangements and wreaths. GROWTH HABITS/CULTURE: Can become very sprawley if not kept trimmed. Becomes invasive. Opens up in shade. Drought Tolerant. Evergreen foliage has a camphor fragrance. PROBLEMS: Can be too aggressive. Invasive as mint. HARVEST/STORAGE: Leaves anytime, flowers when in full bloom. MEDICINAL USES: Native Americans crushed the leaves and rubbed their skin to prevent insect bites. LANDSCAPE USES: Use around doorways to repel flies. OTHER USES: Dye from the yellow flowers. Excellent ant, flea and fly repellent. The dried root is more powerful than the foliage. Sprinkle foliage on ants after chopping and crushing. Yellow flowers are good to use in wreaths when dry. Rhizomes yield a green dye. INSIGHT: Tansy likes healthy soil and plenty of room. Dwarf forms are available, also a gray form. NOTES: Tansy is a beautiful perennial herb with fern like leaves and yellow flowers in late summer. It will help control ants, including fire ants. The leaves can be cut up and then crushed to expose the oils and then sprinkled where ants are active. It repels them very well. Tansy also repels other plants where it is growing, so be careful about where you use it. Q: I have a ten year old Washington Hawthorne. In the past 3 years it is showing increasing dieback and I believe its death is imminent. It had previously grown very well. I’ve removed two dead limbs and the other two plants have dead ends and the leaves are slowly dying and dropping. Is it at all possible that tansy planted under it could be affecting it? I know it has allelopathic properties, but it seems unlikely that it could kill an entire tree. I am ready to move the tansy elsewhere, just in case. Is there anything else that could be affecting it? J.J., Richardson. 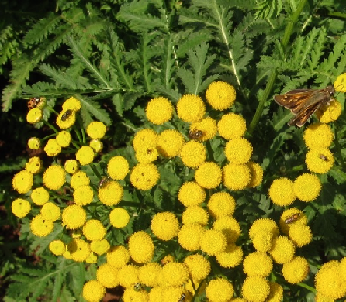 A: Tansy normally only has power to stunt the growth of annuals and other perennials. I doubt it is the tree's trouble. Maybe it's all the rain. Try the entire Sick Tree Treatment procedure.